BOGOR, Indonesia (8 July, 2011)_With the power to influence climate change negotiations and give a voice to those who otherwise may not get a chance to be heard, it is disappointing that the majority of REDD+ media coverage in Brazil has focused predominately on high level policy debates, with little attention being given to national or local level concerns. BOGOR, Indonesia (8 July, 2011)_With the power to influence climate change negotiations and give a voice to those who otherwise may not get a chance to be heard, it is disappointing that almost half of REDD+ media coverage in Brazil has focused predominately on high level policy debates, with little attention being given to national or local level concerns, a new study from the Center for International Forestry Research has found. 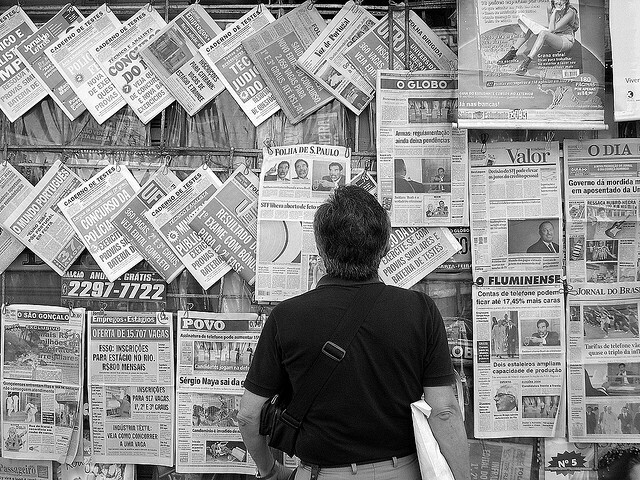 REDD+ Politics in the media: a case study from Brazil, examined media coverage and the nature of REDD+ discourse in four leading Brazilian newspapers from 2005 to 2009. Of the 122 articles that the study examined, almost 50 percent were found to cover policy debates and events at an international level. A large majority of articles were found to be dedicated to policymaking (49%) and economic concerns involving finance and carbon markets (34%), whereas institutional issues such as REDD+ impacts, land tenure and carbon rights concerning REDD+ implementation were largely ignored. “This trend shows that REDD+ is framed more as a political issue, which may explain the slow development of concrete policies and institutional structures needed to implement REDD+ at the national level,” said Peter May, co-author of the CIFOR report. With the core idea of REDD+—reducing emissions from deforestation and forest degradation—being to reward individuals, communities, projects and countries that utilise their forests in a sustainable manner, engaging all levels of society in REDD+ discourse will prove to be critical to the advancement of REDD+ pilot projects currently being undertaken in forest communities around the world. The study found that disputes and debates between the state and the federal level government were much more likely to be played out in a public forum, with both sides using the media for political leverage. The result was that a small number of ‘key actors’ were found to drive the debate on REDD+ whereas alternative voices were underrepresented. Over a third of these ‘key actors’ featured in Brazilian news articles were found to be government officials, with representatives from the Ministry of Environment, environmental policy makers from the federal government and the Brazilian Forest Service most often quoted. Although International Non Governmental Organisations (INGOs) and domestic NGOs were mentioned in just under a quarter of the coverage, representatives from local government and civil societies featured significantly less. Brazilian Indigenous groups – whose rights are now being recognised as critical to the success of REDD+ – were only represented in 2 percent of the media coverage. Despite the global importance of deforestation in the Amazon—the world’s largest remaining tropical forest— a dominant international policy agenda that is being reinforced by the media is stalling institutional progress towards effective REDD+ design. Unless the media can shift this focus and begin to address more local level concerns regarding REDD+ implementation, then the future success of REDD+ projects in the region may be under serious threat.